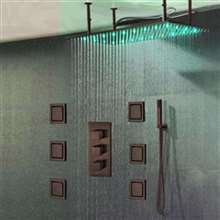 This beautiful chrome rainfall showerhead system comes with everything you can think of. The relaxation of an overhead rainfall, 6 adjustable body jets for maximum relaxation and a handheld shower to ensure all over coverage. Optional LED. The price for this shower set was kind of expensive and a bit over what I intended to spend for such. But then, if it's really as good as it claims to be then I thought it must be worth it. So I got one and had it installed in the master en suite and so far we're loving it. The delivery was quite slow though, so you may want to be more patient when ordering. 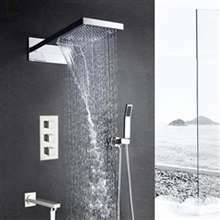 After looking at the different shower sets here in the site, I thought that this would be the best choice to make. It looks pretty minimalist, simple, yet it has this contemporary feel about it. With regards to function, everything works extremely well - impressive would be a better term I think. I specially like using the body jets, they're just excellent.